Click the Subscribe link on the main blog page of that profile. Confirm the subscription by clicking Subscribe. When you do this, you will automatically receive a notice in the Inbox section of your profile when a new blog entry is posted. Click that notice’s link to see the new entry. You can also use subscriptions to let people know what you’re reading and who’s reading your writings. 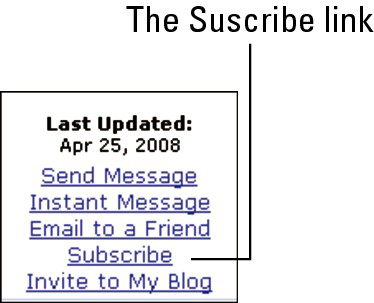 Click the My Subscriptions link in the MySpace Blog box on the Blog Control Center page to see whom you’re subscribed to (as shown in this figure). 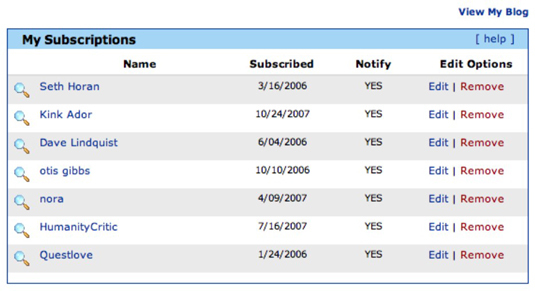 Clicking the My Readers link lets you know who has subscribed to your blog. You won’t see all your readers — just the ones who have subscribed. You can see more generic statistics displayed below the subscription section, as shown in this figure. You can see how many times your blog page has been loaded by week and in total, along with how many comments have been left and who gave you kudos.